And without question, I love this fragrance. 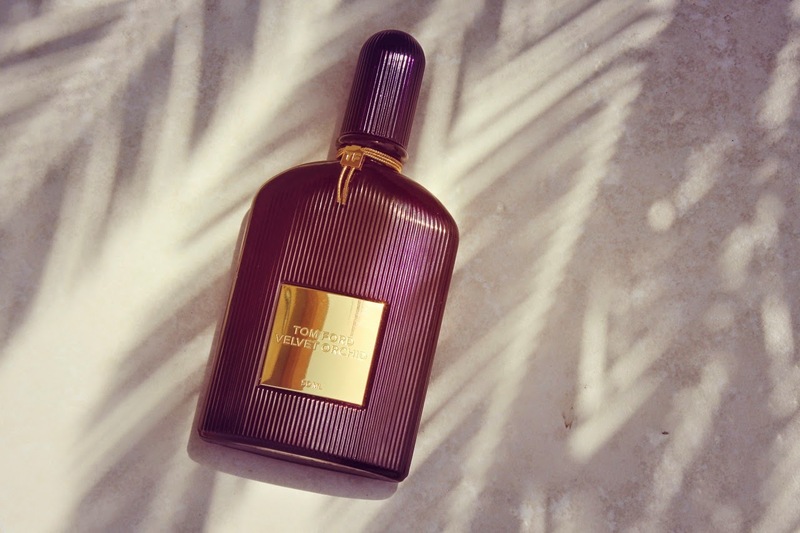 It has more than a hefty portion of the original Black Orchid accord - that hypnotic slightly earthy scent - but within seconds transforms into something different. You get honey, rum, and florals like jasmine and rose. The dry down is intensely warm and maybe even a little powdery. It reminds me of a hybrid of TF Noir and Black Orchid - potent, sweet and addictive. The florals make it feel like a more feminine fragrance when compared to the original but you know what I think? I think this would smell absolutely fantastic on a man as well so the unisex title definitely still holds but perhaps a little less obviously. I saw a review that described this well: "if you hated the original Black Orchid then you'll probably like this and if you liked Black Orchid then you'll definitely like this". What's nice is that they have made this different enough to justify the purchase. Sure, the bottle looks exactly the same (albeit with a purple tint to it) but the fragrance goes in a different direction. If I described Elie Saab as the fragrance worn by a Rich Bird then this would have to be what a Sensual Bird would wear. Velvet Orchid is confusingly not out everywhere at the same time. In the Middle East you can find it at all counters now. Everywhere else it's out from July BUT you can get it on the Tom Ford website now for a not insignificant $112-$159. I think the best course of action is to make a bee-line for the aggressive sales team manning the department store beauty hall/duty free and give it a spray. I am totally a Black Orchid devotee - lusted after it for years and finally got it for Christmas! It's unlike any other perfume I've ever smelt and so long lasting! This one will definitely be making it onto my wish list... probably for a few Christmas' time! It does sound interesting and up my street. However I splurged on Miller/Harris Tuberose on my last flight to Hong Kong and am completely and utterly captivated by it! That does! a) I love MH and b) Tuberose is amazing. Will have to hunt that one down! I definitely need to try Tom Ford fragrances again! AH tom ford do amazing perfume, i love the black orchid. Have to admit it Laura, I'm a Tom Ford perfume virgin and haven't tried any of them :( I will however be hot trotting it to my nearest counter next weekend after reading this. I'm intrigued! :) Hope you're well and have had a good start to your week over there in the sun! I've never tried anything from Tom Ford, being in America, it's harder to come by. Now I'm lusting over this! love the way you have described this, may have to go and try this! I'll have to give this a sniff. A friend gave me White Patchouli and even though I SHOULD have liked it I really, really didn't. I haven't given another Tom Ford fragrance a chance but maybe I dismissed it too soon. I've never tested this so I'll have to try it - I do have his Black Orchid lippy so if I love the fragrance as much as his lip colour then I'm onto a winner! I bought the Elie Saab on your recommendation & LOVE it! I really impressed together with your writing skills as well as with the layout for your blog. Anyway keep up the excellent quality writing, I also have information about the new project Nirmal Olympia. Oh my, I really liked Black Orchid. I first brought it after you reviewed it on your old blog and talked about it being the lady at the party in the glam coat or something. I've being thinking about buying Neroli Portofino for the summer because Portofino is one of my favourite places in the world but now, I'm thinking I should check out this Velvet version. You've made it sound gorgeous and I do like those slightly powdery scents. I actually hated Black Orchid when I smelled it, but I'm definitely willing to reconsider and smell this! I hated Black Orchid too, but I love this. It actually, to me, doesn't smell like Black Orchid at all. Onme it is pretty sweet and uncomplicated from the start. I really impressed together with your writing skills as well as with the layout for your blog. Anyway keep up the excellent quality writing, I also have information about the new project Runwal Mydesire. Cool! I am not on the Black Orchid fan train personally, the perfume I have been using nonstop is super rando, its Jennifer Aniston's perfume! I bought the rollerball on sale at Sephora for like five bucks cause I thought, why not, and it has literally become my favorite perfume! I ordered the full size online! It is light and floral with musky undertones, its perfect for everyday! May not want connecting with their children due to its association with musical.ly. Lively Musically Download It's a great deal like Facebook Live, yet instead of depending on your Musical.ly friends.